The name is Lumia. Nokia Lumia. Nokia is working on a new batch of Windows Phone 8 handsets under the direct influence of its new masters at Microsoft, and a Twitter leakster claimed to be privy to some of those devices' codenames. Some upcoming Nokia devices are currently known internally as "Goldfinger," "Moneypenny," "Normandy," "Phantom" and "Spinel," according to a tweet from @evleaks. The knowledgable tipster as usual gave no source for its information, but evleaks has proved accurate enough times for our ears to pick up when they speaks. And while a device's codename isn't always a clue to its form or functions, in this case these oddly referential names just might be. Goldfinger and Moneypenny are the names of classic James Bond characters. Goldfinger is a Midas-like villain who's obsessed with gold, and Moneypenny a flirtatious secretary. The Nokia device codenamed Moneypenny could have an emphasis on business or even be something else entirely, like a smartwatch - the original tweet only mentioned "Nokia products," not phones specifically. "Goldfinger" probably doesn't refer to a gold-plated phone, though with high gold iPhone demand Nokia could well be working on a metallic device with a similar champagne hue. One of the other codenames also supports the theory that Nokia is moving past plastics for its Windows Phone handsets: "Spinel" is a magnesium aluminum mineral. Does that mean aluminum phones are in the works at Nokia? Maybe. Or maybe someone at Nokia has just been watching a lot of Breaking Bad. They're minerals, Marie! The Phantom and Normandy are more mysterious, though we can't help but think of Mass Effect for the latter. Maybe it will include space travel? For that matter, perhaps the 007-inspired products will feature some of Q's famous gadgetry. Anyone up for a Windows Phone with a laser beam? 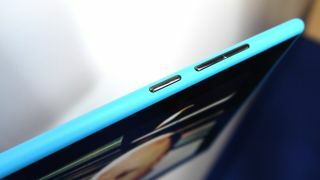 See how Nokia's latest stacks up in TechRadar's hands-on review of the Nokia 2520 tablet!